Google announced that Google Analytics is now getting some of the messaging features from Google Search Console. 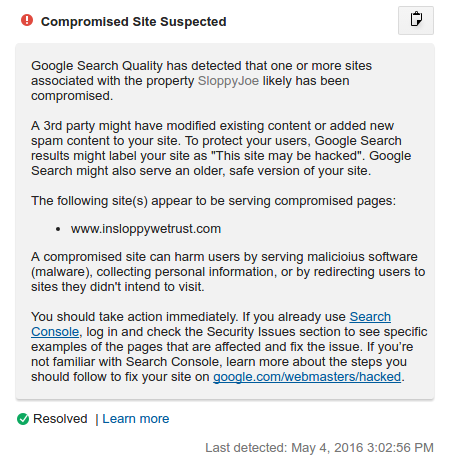 This one is about hacked site alerts, hacks that actually make your site go against Google's webmaster guidelines. Your site does not need to be linked from your Google Analytics account to your Google Search Console account for it to work. It works regardless, which is really nice. Today, we’re happy to announce that we’ll be expanding our set of alerts in Google Analytics by adding notifications about sites hacked for spam in violation of our Webmaster Guidelines. In the unlikely event of your site being compromised by a 3rd party, the alert will flag the affected domain right within the Google Analytics UI and will point you to resources to help you resolve the issue.